A Faithful Tribute to Decades of Tone. The latest masterpiece from Greer Amps is here. 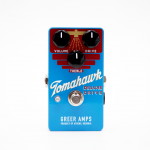 The Tomahawk derives its sound from the big tweed amps of the 50's that ignited rock and roll and beyond. 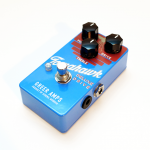 It's amazingly touch sensitive and musically versatile - there is no bad setting on the Tomahawk. You can run it at either 9 or 18 volts, with a slight compression at 9 volts and major headroom and tightness at 18 volts. Tomahawk lives to be stacked with other pedals. 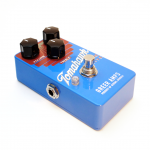 It works really well as a second gain stage, where it's pushed harder by your favorite boost or drive for an even more amp-like feel.